Jesus sure has a lot of adventures. I think I should travel with him for awhile. I’d have all kinds of things to put on my blog. Maybe I could pretend that His adventures were really mine. What do you mean that wouldn’t work? I bet I could do miracles if I tried. I licked you ankle once and it got better. Okay, I’ll listen to the story. On His way to Jerusalem Jesus traveled along the border between Samaria and Galilee. Is that a long ways away? Do I have to go all that way to have adventures with Jesus? Maybe He could come over here. Good thing they stayed at a distance. I bet Jesus didn’t want to catch leprosy from them. When Jesus saw them He said, “Go, show yourselves to the priests.”And as they went, they were cleansed. 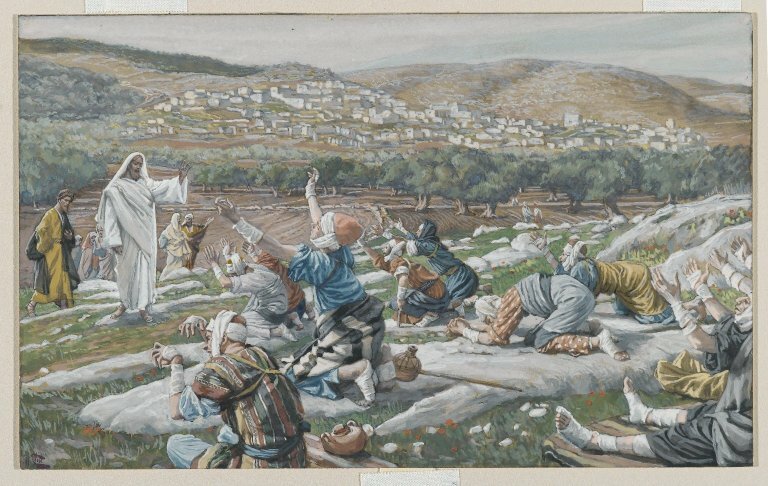 One of them, when he saw he was healed, came back, praising God in a loud voice. He threw himself at Jesus’ feet and thanked him – and he was a Samaritan. Was that like the good Samaritan? What? The Jews didn’t like the Samaritans and Jesus was a Jew? That Samaritan must have been pretty brave to come back. I wonder if faith works for other things besides making people well. I have faith that I will get treats. If I close my eyes and say, “My faith has brought me treats,” will it work? Hey! I don’t see any treats here. My faith has brought me treats. My faith has brought me treats. Marina, I knew my faith would work. When I open my eyes the fish will be here. Woo woo! Bongo, I like how you think and your responses to the story. You are a good listener. Merry Christmas, I hope you get toys and treats. Thanks Andrea. Merry Christmas to you too. Treats? Did I hear treats? Faithful dogs. That’s a treat for people, Bongo! Karen, I sure agree there. What would you people do without us faithful dogs. The other nine didn’t have faith, so that was why they didn’t come back as they were not cleansed? You’re a very faithful dog, Bongo, so I’m sure You’ll get treats on Christmas Day! Kevin, this story sounds simple, but it’s actually kind of complicated because it says that all of the lepers were cleansed. Maybe the person who came back and thanked Jesus was healed of more than just his physical disease. Maybe he had emotional or spiritual problems that Jesus healed. I sure hope I get treats for Christmas. For me it’s still one more sleep. Sue Ann, I’m hoping for lots of treats for Christmas.